Martyrdom was a repeated theme of the legends of Charlemagne’s Spanish campaign and the Miracle of the Lances at Sahagún was perhaps the most exemplary episode. 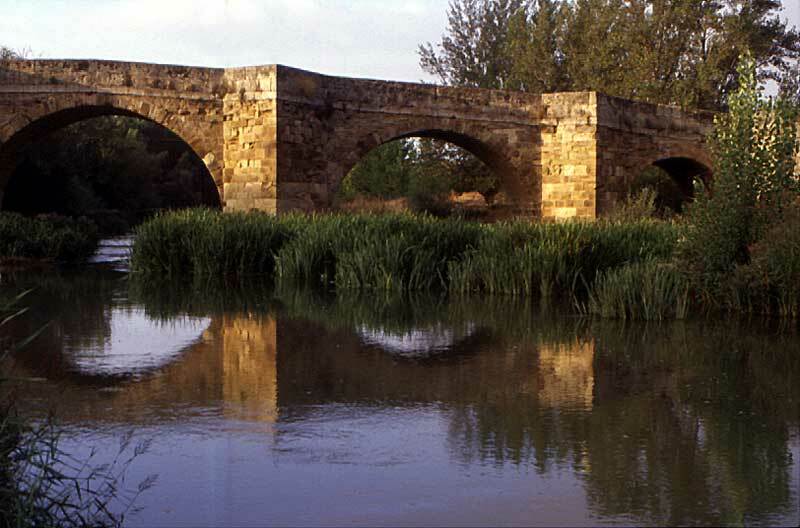 Sahagún stood firmly on the pilgrimage road which traversed bridges on either side of the town. It was here that, according to the History of Charlemagne and Roland, the Frankish army fought a pivotal battle in its campaign to liberate Spain and Compostela from the Saracens. On the banks of the Rio Cea, Charlemagne faced the army of Aigolando in a lengthy contest. As at Monjardin and ultimately, Roncevaux, the battle of Sahagún developed the theme of the martyrdom of the Christian warrior which runs through the whole epic narrative. “Then did this miracle happen. Certain of the Christians who carefully had been furbishing their arms against the day of battle, fixed their spears in the evening erect in the ground before the castle in the meadow, near the river and found them early in the morning covered with bark and branches”. The spears, dead wood returning to living wood were alluding to the afterlife in Paradise and Christ as the Vine, a common image in Romanesque sculpture. The miracle of the spears was also part of the continuing process of denoting the Franks as God’s chosen people, taking its source from the story of Aaron’s rod in the Book of Numbers. In that Old Testament account, the overnight flowering of the rod signified the preeminence of the House of Levi among the twelve tribes of Israel, marking them out as being the only ones to be elected to the priesthood. In the crusading era the epic legend of Charlemagne and Roland exalted the role of the Christian warrior to a privileged position whose death in battle would guarantee election to Paradise, where they might join that other caste in the tripartite division of medieval society, the priests and monks. An equation was thus made between the priestly caste of the Old Testament House of Levi and the medieval warrior martyr. The Frankish warriors cut their spears to the ground, but the vine continued to flourish. They eventually grew into tall trees which, the legend assures us, could still be seen by pilgrims in twelfth century. In the ensuing battle forty thousand Christians were slain including the general Milo, father of Roland. Reinforcements of soldiers from Italy, caused Aigolando to retreat to León and Charlemagne then returned towards France. The Pilgrims Guide informs us also of Sahagún that, “Next to the town there are wooded meadows in which, as one is told, the planted poles of the warrior’s lances bloom”.